By: Ivan Pedruzzi, Product Architect, The Stylus Studio® Team. Nice and easy if you are dealing with XML documents, but what happens if your data is not all XML? Assume for instance that we need to exchange data with a business partner who requires files using a specific XML dialect, but that our data is tabular and is stored as CSV files. The first step is simply to create an XML representation of our CSV data. Though some of the specifics vary (additional parent elements, different element names, and so on), because the data is now in XML format, XSLT can be used to create the final XML result. So, that's the theory (CSV to> XML to> XSLT to> XML), but how do you make it all work? Even assuming you have an XML document that represents data stored in CSV format, the prospect of writing XSLT can be daunting. It might sound intimidating, but using Stylus Studio® we can create solid, complex, bug-free XSLT in just a few steps. Create a new XSLT Mapper document. 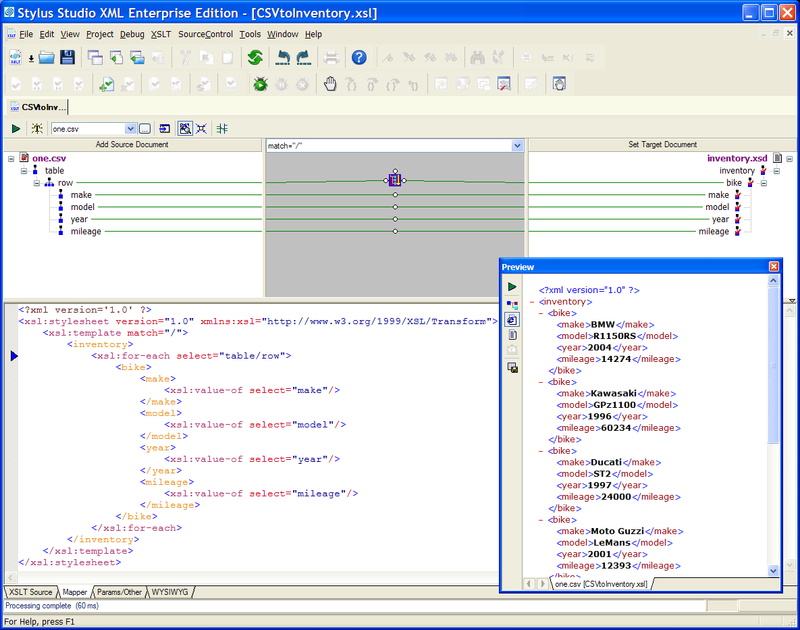 The XSLT Mapper generates XSLT code based on the maps you draw between source and target documents. You know what they say ... a picture is worth 1000 words. Stylus Studio® did most of the work for us — converting CSV to XML, writing XSLT code based on simple mappings — but what happens if we need to perform the same steps periodically, perhaps as part of larger application so that we can automate the process of exchanging inventory information with our partner? The answer lies in common URLs, and Stylus Studio®'s uncommon Java runtime library. URL stands for Uniform Resource Locator. URLs allow us to use a symbolic name to reach a document that either exists somewhere or gets created dynamically when the address represented in the URL is hit. If you look closely inside the Stylus Studio® Project window, you quickly realize how converters work — an converter is represented as a URL, like FTP, HTTP, FILE, and so on. converter: URLs always start with a scheme like HTTP. Stylus Studio® recognizes a special type of URL, one that uses converter as its scheme. CSV: Defines the converter we want to invoke. newline=crlf:sep=,:first=yes:escape=\:quotes='": Parameters are specific to individual converters. For instance, in our CSV converter, first=yes instructs Stylus Studio® to use the first row of the CSV file as list column titles, which in turn are used to provide element names in the final XML document. ?file:///c:/one.csv The name and location of the input file, specified as a URL, that we want to convert. If the converter URL was universally understood by the Java URL class, we could use it as we would any other URL (like http://www.stylusstudio.com/press/news.rss, for example). Let's go back to the original JAXP example. Wouldn't it be cool if we could use the converter URL to specify the argument for the Java StreamSource method — that is, to effectively use a CSV file as a source for an XSLT transformation, and do it all programmatically? Thanks to the Stylus Studio® runtime library, we can! JAXP defines a clever mechanism that allows XSLT processors to delegate URL resolution to an external component called the URIResolver. The XSLT processor invokes the URIResolver to turn a URL used in document(), xsl:import, or xsl:include instructions into a Source object. We hope you enjoyed this overview of Stylus Studio®'s runtime library. Happy Java programming!